Hello, everyone! It's that time of the month again - the setup for June of 2016. Though most of my spreads are staying the same, there are a couple of differences because of summer break. 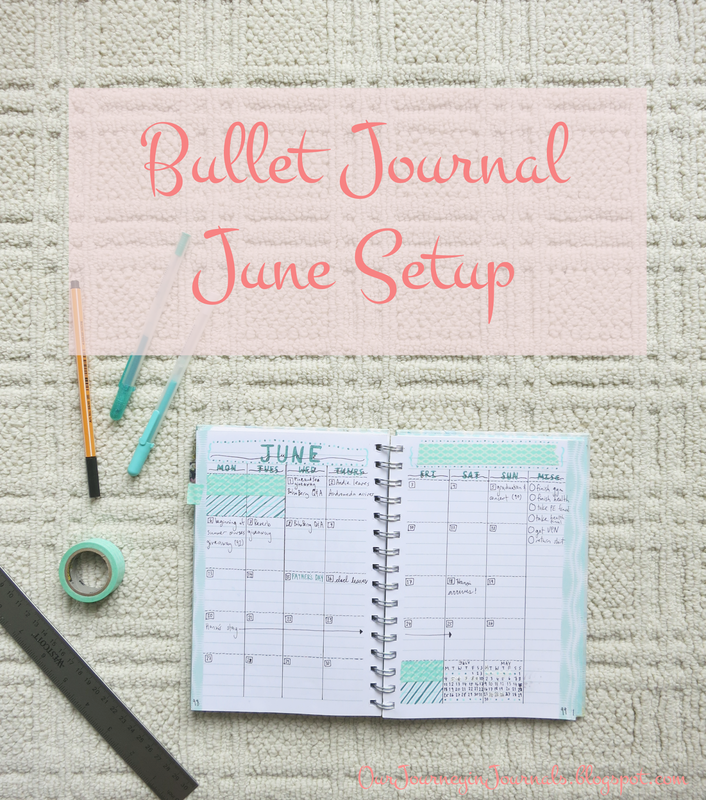 But anyway, let's get into my June bullet journal setup! 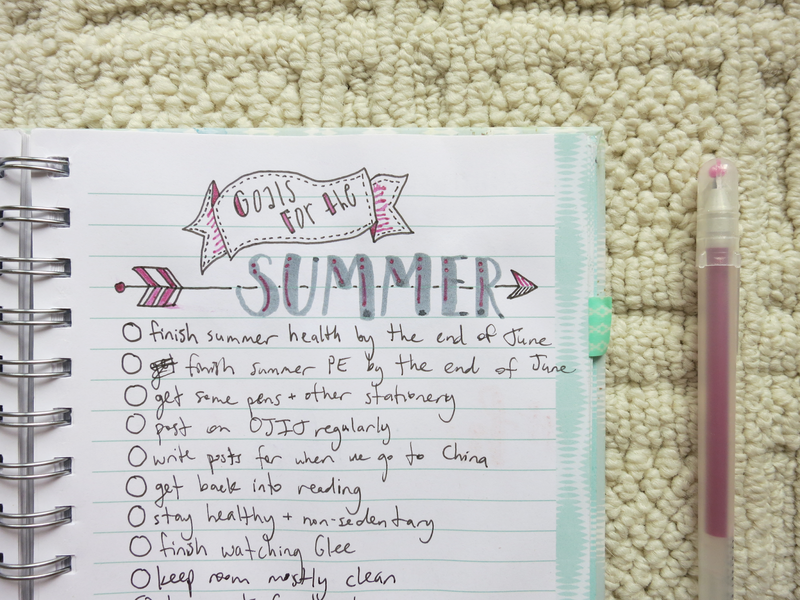 Just to get started into the summer, I made this really pretty "Goals for the Summer" spread. I think it's quite self-explanatory. I've really been enjoying this type of calendar monthly spread. Something that I don't think I've mentioned before, but because there are 24 lines per page in the notebook I use, one week of the month has to have one more line (if I want to extend all the way to the bottom of the page). Though it can make the spread look a little lopsided, it makes me actually think about which week will be the busiest; plus, I tend to actually need that one extra line. Each month, I always do all of the headers in a specific color theme and type of lettering. In April, it was all gold-themed and mostly with lettering that is similar to this font. 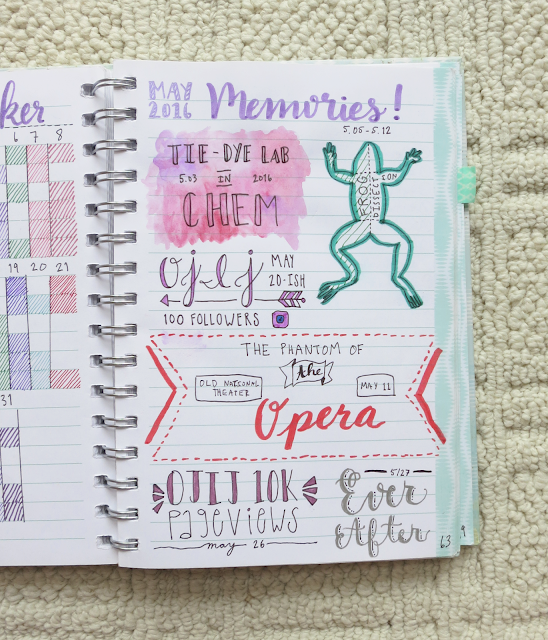 In May, I used purple and primarily brush lettering. However in June, I went with a teal/mint theme, and I'm using headers inspired by Bree Berry. 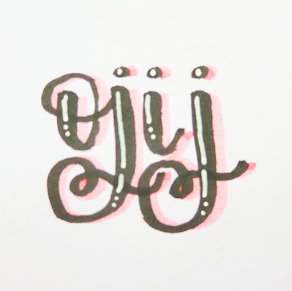 Unfortunately, I don't have a marker in the color I wanted, so I used a metallic Sakura Gelly Roll instead. 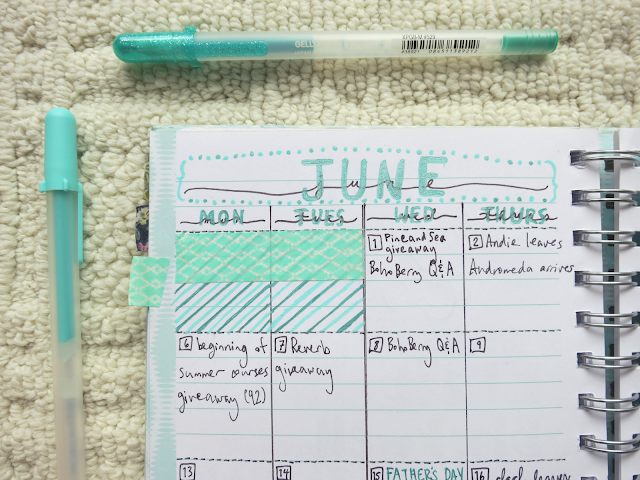 Though the teal looks really nice, the Stabilo Point 88 doesn't show up well on top on the gel pen. Also, I decided to go with a Monday start. Well, I actually didn't decide it, so to speak - I began to write in the days of the week when I realized that I accidentally wrote in Monday first. But it's fine; I just decided to roll with it. I was planning to label this "brain dump," but I changed it to "misc. "because the former wouldn't easily fit on one line. 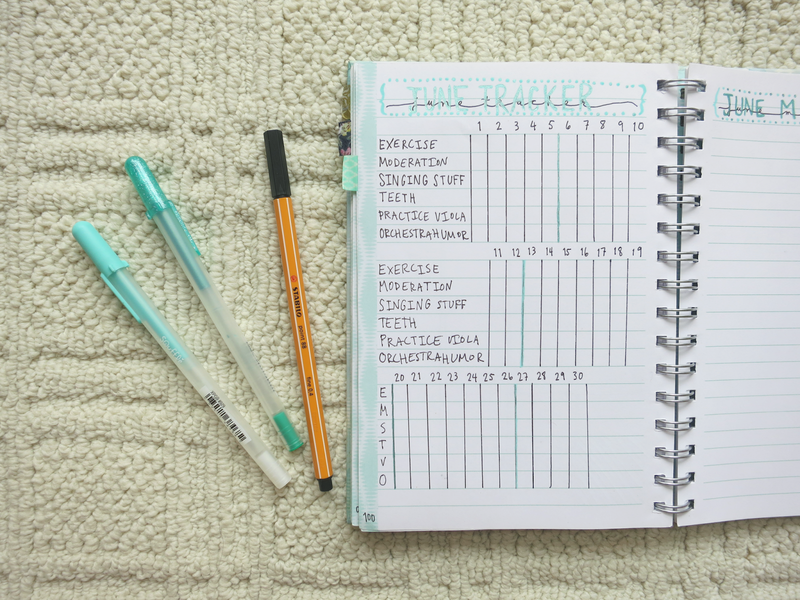 Here, I will put any non day-specific tasks and random notes that I'll need in the future, though it only has tasks right now. Haha, don't look too closely at this spread; I did a lot of stupid things while setting it up. I learned the hard way that the Stabilo Point 88 can be smeared by water. I also used a lot of Wite Out in order to cover up all of the dumb mistakes that I made. 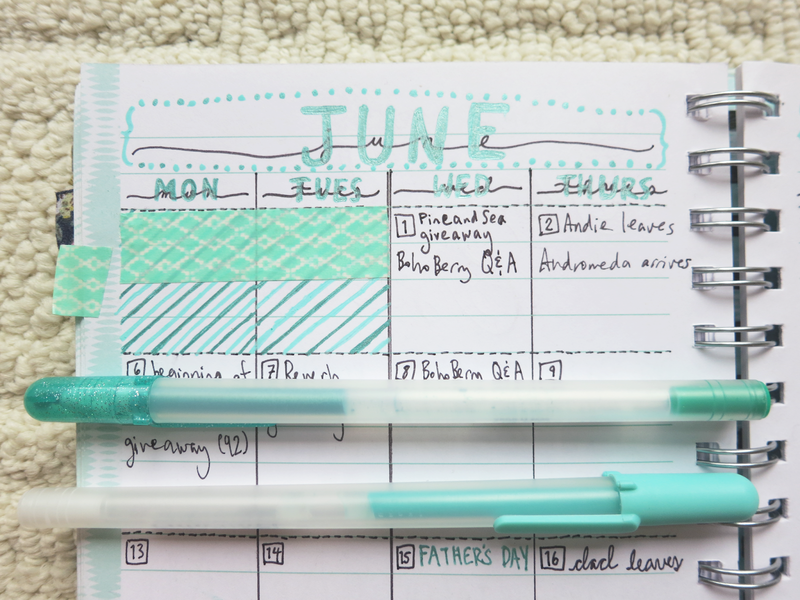 I kept this habit tracker for my June setup. The only change is that I swapped out "sleep by 11 PM" for "singing stuff." Because of no school, it's not as important anymore for me to go to bed by a certain time. 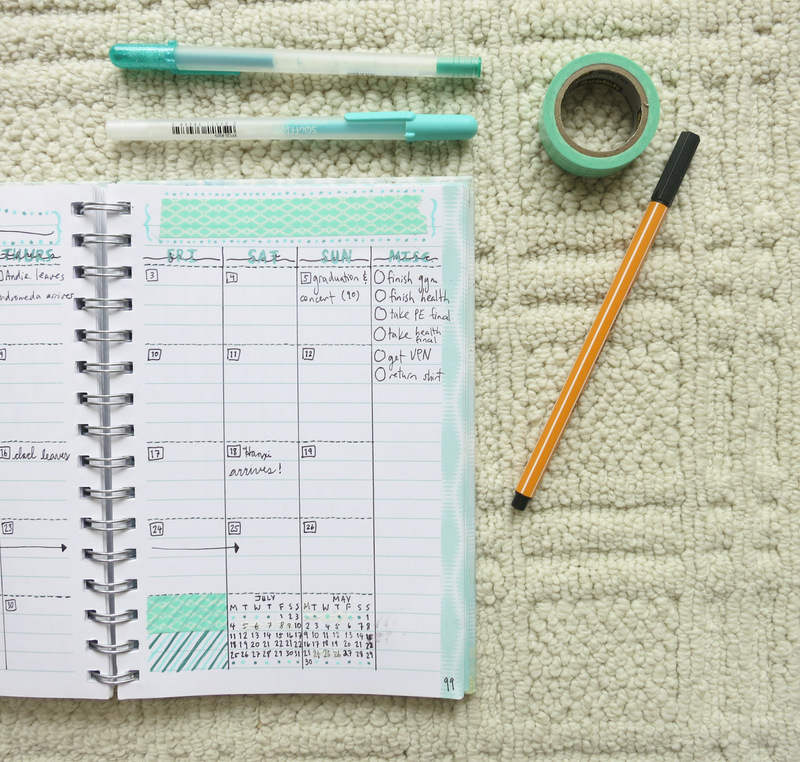 Like usual, I used color to divide up the weeks. Also, I messed up with the second row of items - but shhhh, we don't need to talk about it. Last month's memory page was a BIG improvement from April's. My lettering was a lot better and prettier in my opinion. This spread brought me a lot of joy in creating it as well as just looking at it, so of course, I kept it for this month's setup. (But seriously - 10,000 pageviews on this blog? Thank you all so much!!) I can't wait to see how this page will look by the end of the month! Definitely the biggest change in my bullet journal this month is my implementation of a weekly spread. 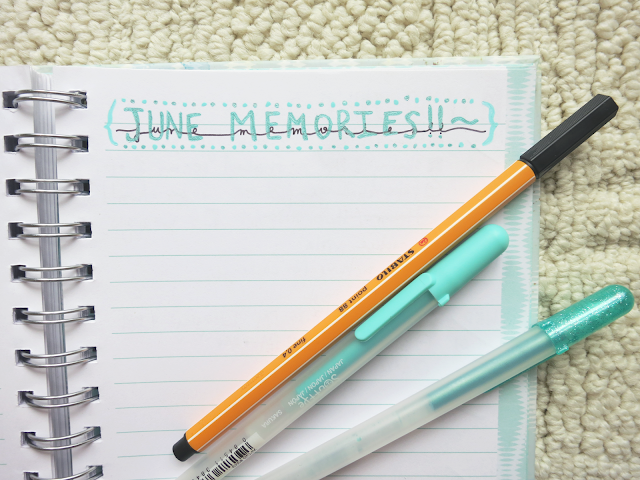 Previously, I just had monthly and daily logs, which worked well during school. 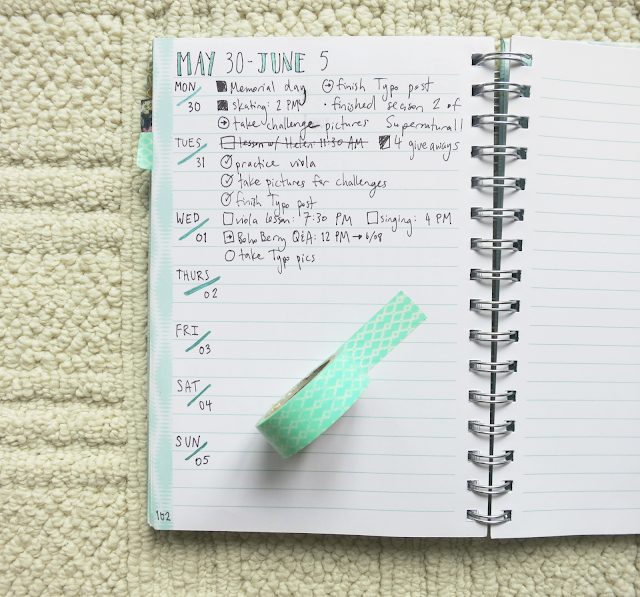 However, I replaced the daily spreads for a weekly one instead because I won't have as much to do and write down during summer break. Plus, I only have about 40 pages left, and I want this notebook to last at least till the end of June. There are so many good challenges during the month of June, but I'm doing two online courses - summer PE and summer health - this summer. It doesn't help that I'm going to be in China for the majority of July, so I'll need to finish these two courses and take the final exams before I leave. Thus, I probably won't have enough time to do any challenges this month. So this was my June setup in my bullet journal! 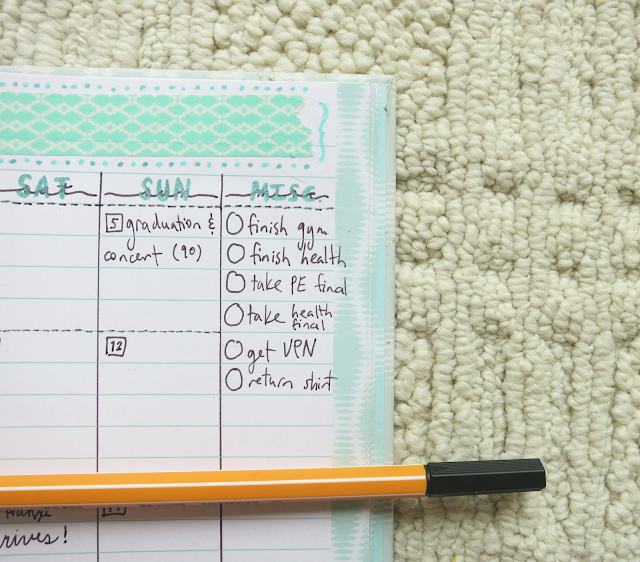 Overall, there weren't that many changes, except for the implementation of a weekly spread instead of a daily. It's good to know that my system is pretty much working for me. Click here for last month's bullet journal setup. 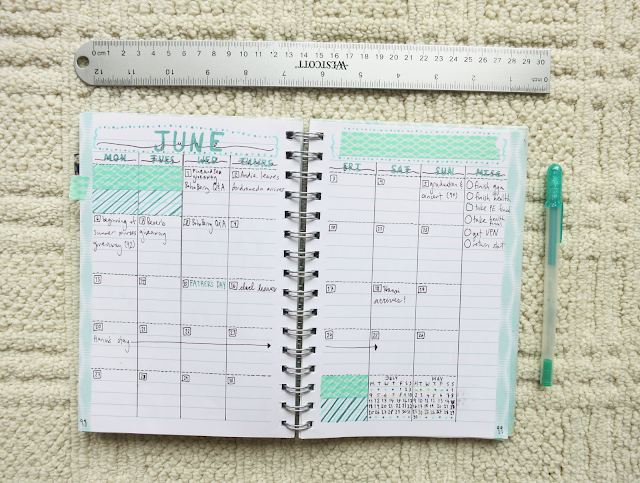 What things did you change in your bujo for June's setup?